Join us February 28 for a screening of the dark comedy and 2018 Tribeca Film Festival "Audience Narrative Award" winner "To Dust"
To Dust is directed by Shawn Snyder and stars Matthew Broderick and Geza Rohrig. An audience conversation and Q&A with producers Emily Mortimer and Alessandro Nivola will follow the film. Grieving the recent death of his wife, Shmuel (GézaRohrïg), decides that, in order to move on, he must understand the science behind the decomposition process of his wife’s body — despite the blasphemy inherent in any scientiﬁc inquiry. To assist his "sinful" pursuit, he seeks out Albert (Matthew Broderick), a community-college biology professor who Shmuel enlists to teach informal science lessons. These soon grow to include homemade experiments and a road trip to a body farm, and, as their macabre misadventures and unlikely friendship grow ever more peculiar, the odd couple proves they will stop at nothing to satiate their curiosity and, ultimately ﬁnd Shmuel the peace he seeks. 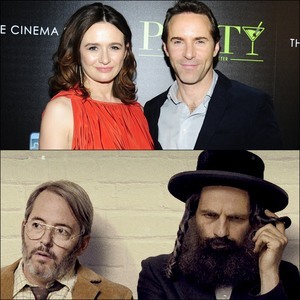 Stars and To Dust Producers Emily Mortimer and Alessandro Nivola will be on hand for an audience Q&A led by Bedford Magazine Editor Jennifer Stahlkrantz after the film.